The story of God written in intimate love letters just for you. Dr. Larry Crabb knows that if we could see the larger story of God and humanity, our world would never be the same. That story is found in large part in the sixty-six letters of the Bible. Written in a conversational first person, as if God is speaking directly to us, Dr. Crabb looks at each individual book in scripture and boils it down to a one- or two-sentence message to us from that particular book. He then unpacks each sentence in a short chapter answering the question, What does God want me to hear from this love letter? The book's epilogue then fits all 66 pieces of the jigsaw puzzle together into one coherent paragraph and reveals the beautiful picture of what God has been about since the creation of the world. Far from being comprehensive, this is a personal approach to helping readers know God and his great love for them, his message for all mankind, and how their lives fit into His larger story. Would you listen to 66 Love Letters again? Why? I will listen to the book many times. It is that good. This is the most unique experience I have ever had with a book. The intimacy that one develops with the author and our God is very personal. Listening and thinking about this book and the bible has exposed me and revealed to me my pride, unbelief and self-centeredness while at the same time pointing toward God and his grace, mercy and love. I am loving learning about God's story and how my story fits in God's story. This book is amazing in helping the listener and/or reader understand God's love and embrace His movements toward us so what we can fully enter His story with ours. What was one of the most memorable moments of 66 Love Letters? Learning through the life of Solomon that Success is not Greatness. Larry and Jim do a wonderful job reading this book, however, I wish Jim's voice was more different from Larry's. I keep wishing the voice of God was deeper and more distinct from Larry's content. No, it is not designed to be experienced that way. 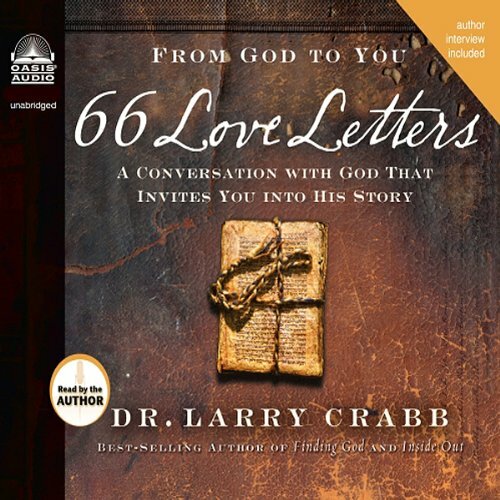 A must listen: God's Love letter you. You can hear the prayers that went into this book; the inward-looking, produced by the Holy Spirit, and the courage for Dr. Crabb to be authentic in his estimation of where he struggles in his faith, and so much more. If i had one reference to recommend to someone as to what the Bible is, and isn't, I'd recommended this audiobook. You can hear the incredible love that went into it, as well as, the challenge for you and I, to look at the Bible, as God's love letter, to us. Enjoy! First of all, this is a heavy book. It talks a lot about subjects that most churches and Christians do not. This book is taking every book in the Bible as a personal letter written by God to the reader. This book has helped me grow up my faith in a dimension I did not know I was lacking. This book was very honest and helped me understand and focus on areas I didn't know I was lacking in. I would very much recommend for those looking to develop their faith. Packed chock-a-block with inspiring truths. A profound insight into the true message of the Bible. Highly recommend this to anyone seeking a better understanding of their relationship with God. I coupled this audio book with the word of promise complete audio bible, listening to each book of the bible before the chapter pertaining to it. (well after the first several chapters I did). the book was not what I expected, but it has been transforming. (going through the bible intentionally and honestly and grappling with questions it poses will always be transforming, but the book played an interesting part). The author isn't so much digging into deep theology (per se) as he is having a frank and honest look at God and the difficulties we struggle with when grappling with who He (God) is. Done in a conversational format between himself and God, the voice of "God" took a few chapters to het used to, but from there on this book was a ministry tool God used to give me the freedom to question honestly, and as was true of the author, that honest questioning was relationship inspiring. I didn't agree with everything (though honestly I'd have to say I did with most), and I didn't like all that I agreed with. God as a character in the ultimate story the He Himself is telling, is a complex character. Larry drew that out very well. In the end, its just a book, but a book God used to grow me deeper in love with Him... despite the parts of Him I still find hard to take, but take Him I do, for He took me first, and I see the fingerprint of His love more places than I have before. I hope this review is helpful. may God bless you richly. Yes, it made me mad at first because its like just after a fight with your husband awful thing can be said so... in the beginning of Genesis sound like God could never say nor think that way...but as I read on the more I began to think yeah maybe so...so like a love letter the more I read the more of wanted to understand what He was feeling...Feeling how very much He could care...God is the Agape Lover! Would you listen to another book narrated by Larry Crabb and Jim Cress ? The Workbook for 66 love letters is only a 40 day study but can help direct your group study . In spite of it all, I still Love and Desire You! I very good book breaking down scriptures into simple understandable principles. It is not a theological study so there may be many areas that you may disagree with. However I feel that it was an overall good presentation of the Bible. Thank you Larry Crabb. Thank You Lord! For speaking exactly what I needed to hear. Great knowledge, insight and format. I really enjoyed the format as a conversation with God. ...don't bother. Very disappointing. Very judgemental. Would you ever listen to anything by Larry Crabb again? Never. I'm trying to find my way to God...not fear Him. The description is misleading. I would never have spent money on this book had I known the truth. Be more honest describing this book!